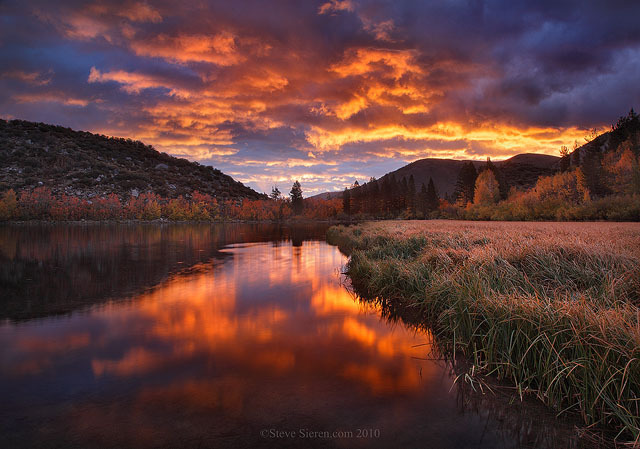 Maybe this is my perception but I feel most photographers go nuts over a sunset reflection, if it’s in front of them. Maybe even prefer it over the golden hour when the best light hits the land and creates interesting light and shadows on the subjects that are important in our photographs. Most of the time I think these sunset colored clouds are just background decor to add a little something extra to a scene that doesn’t have the greatest light. Something to just accent an image. Am I the only one that feels this way? 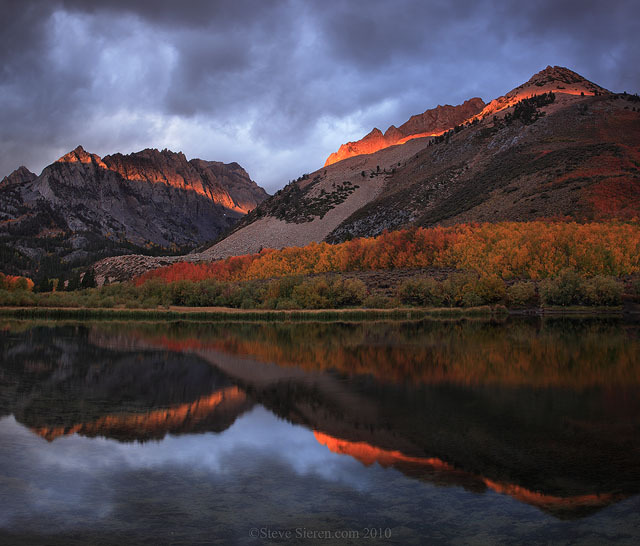 Field notes: Early that morning at North Lake in the Eastern Sierra, as soon as light of dawn revealed there was cloud cover and we could see that the holes in the clouds would likely let some good light through in a few a places. I was with a couple of friends but we all had different agendas, one of them did not want to go into the mess of crowded photographers at the creek outlet of North Lake so he went of into the aspen groves and we never saw him again until we were ready to leave hours later. We had parked on the north side of the lake where it’s a longer walk to the popular spot there. I chatted with a few strangers but kept it short. I took a photo looking towards the White Mountains and figured I’d at least better get into a position where I could at least shoot into multiple directions. There is a creek you must cross or take the long way around, it was at least 32 degrees out and I didn’t want to get my feet wet but I had a change of pants, shoes, and socks in the car if needed. Before I knew it I was crossing the creek to take a couple of different shots in both directions. The light was good and I was only spending between 30 seconds and a couple of minutes composing scenes, usually I take longer then. There was a sense of rush but I still very calm in between exposures. This photo does’t really show how crowded it gets in this one spot here at North Lake but I’m sure you could imagine. This entry was posted on October 24, 2011 at 1:13 pm and is filed under Uncategorized. You can follow any responses to this entry through the RSS 2.0 feed. You can leave a response, or trackback from your own site. Love this! What are you shooting with? Chris, thanks! I’m shooting w/ a 5D MII. Was your profile shot taken in the tunnel on 20th St. near Coors Field? I have a the funniest picture taken there but it’s not really for the internet. Hey Steve, Nice post & too funny – I am the 4th from the right in the line up. I had a small workshop and we posted up at this spot well before sunrise. The light was amazing & well worth “fighting off the crowds”. I have seen other photographs from that day – which was more than spectacular. This year was completely different, the aspens were all bowed down under 12 inches of snow. This makes twice we have been in the same place at the same time! I think we’ve been in the same place many more times then just twice. I should of said for everyone to identify themselves in the photo! The funny thing is the guy with the umbrella shooting with the i-phone! I still want to kayak the Virgin River when if you guys still do that! Great shots, Steve. I always enjoy hearing about your adventures! As always, powerfully beautiful images, Steve. I particularly like the mountains and lake with the bands of sunlight across them. 9 other photographers standing in the same spot is way too many for me – and you say there were even more? The second shot here, the mountains with orange stripes reflected in the water and that dramatic sky is really striking. I judge poems by whether or not i wished i’d written them, songs by whether or not i wished i could sing them and photographs by whether or not i wished i could be there – i wish i had been there when that photo was shot, i wish i could have taken that photo. Great shots, Steve. I don’t have any desire to shoot North Lake at sunrise. It was busy enough the other times I’ve been there. As for the shooting philosophy, it depends on the photographer. Galen Rowell for instance liked to chase light and find something earthbound to match it with. It’s evidenced in many of his best-known photos. Then there’s more methodical photographers who will sit for days and hours in a certain spot waiting for light with a specific composition picked out. There’s no right answer in my opinion. Thank you Derrick and David! That’s a great way to look at photography and to judge it by. 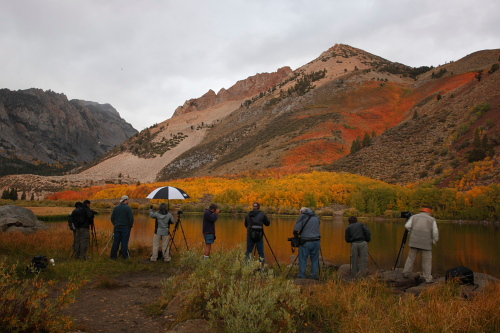 It’s a great example of how many of the photographers end up at this lake, including myself. We all want a photograph of it because we were all inspired by someone else. Richard, it’s no doubt that North Lake can be a mad house on the weekend during fall season. The crowd can get so big you’ll sounds that resemble a ballpark stadium crowd booing at the missed catch only it’s really an early fisherman in a floating device trying to enjoy the place just the photographers are. About the light chasers and waiters, you’re right there is no right way but you also have the people doing both. I’m just asking are we really just chasing a sunset?